Located in a charming house on Santa Monica Blvd.I fondly remember La Cachette Bistro, “the hideaway” in Century City. After telling a girlfriend that I would be dining at the newer location in Santa Monica, she replied, “that is one of my favorite restaurants ever.” She has never tried the Santa Monica location, but remembered many wonderful meals near the Century City shopping center. Walking up to the ground floor of an office building and across the street from Le Merigot Beach hotel and spa, the bistro presents clean, modern lines. Fabrice, the manager, shared with us that they are in the process of redecorating to appeal to a younger crowd. In the past, La Cachette Bistro drew a more mature, established clientele. Gone are the formal white linen tablecloths. The bar will be designed differently and chef Jean-Francios Meteigner has created a more reasonable French Tapa menu with many of the items between $4 – $12. When we arrived on a Sat. evening, the main dining room was so loud with boisterous diners, that we requested a quieter table next to the bar. The place was filled with mature patrons, however a sprinkling of the young and trendy were present. On Friday and Saturday evenings after 9 p.m., guests receive 30% off their bill while enjoying French tapas and cocktails in the dining room. We started with a fresita (blend of Chilean sparkling wine and fresh strawberries from Patagonia). It arrived in a little bottle and was a little too sweet for my liking. The Ocean Flower cocktail had Resposado tequila, elderflower liquor and a large basil leaf floating on top. It looked like a martini, yet tasted like a margarita. 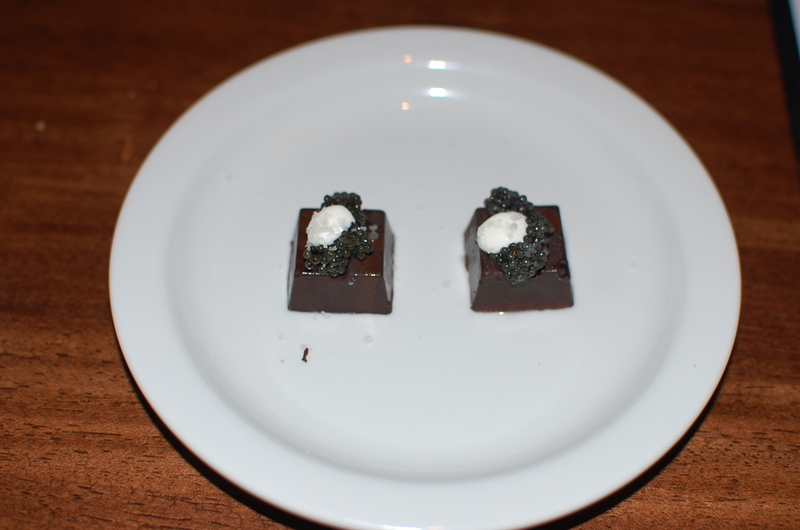 Chef Meteigner came out of the kitchen and delivered a plate of dark truffle chocolates with a dollop of caviar and crème fraiche, I found the sweetness of the chocolate and crème fraiche offset the saltiness of the domestic caviar. Our first tapa was an apple corn polenta brulee with a generous sautéed foie gras on top. It was sweet with the apple and creamy with the corn polenta. Next, a homemade foie gras terrine with rhubarb gelee and two slices of housemade brioche toast arrived. Though delicious, but reminded me of a breakfast dish with the two pieces of toast. The rhubarb gelee was more like jello in consistency with a pleasant rhubarb flavor. 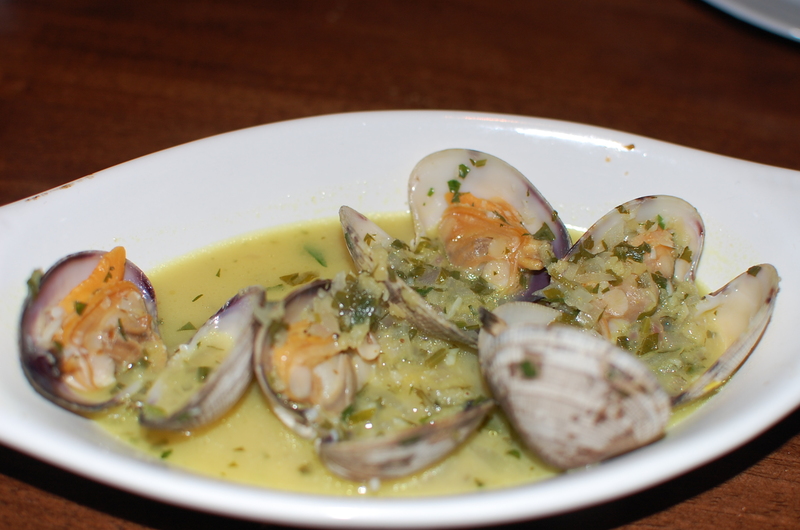 Warm steamed clams arrived in an Asian tasting ginger/garlic broth and slightly blackened swordfish belly was delivered with a wasabi and ginger mash. The belly is richer tasting than a swordfish steak. This tapa is the perfect portion. 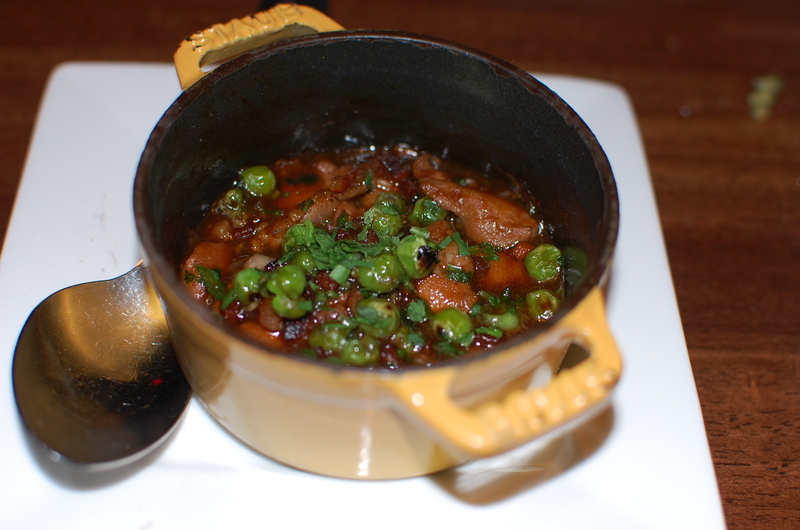 Fabrice delivered an adorable copper pot filled with chicken oysters, red wine, bacon, peas and carrots. It was “coq au vin” style. When I inquired about chicken oysters, Fabrice said, “In French they call it solilesse, which means you are stupid if you don’t try it.” It’s the delicate morsel of meat found in a small cavity of the back of a chicken. It was very tender, yet the bacon flavor dominated the dish. Our last tapa was the baby back ribs with a housemade raspberry vinegar bbq sauce. Baby back ribs in a French restaurant? They were tasty and arrived on a bed on lentils. Since the portions were small, we were open to trying a few of Meteigner’s desserts. 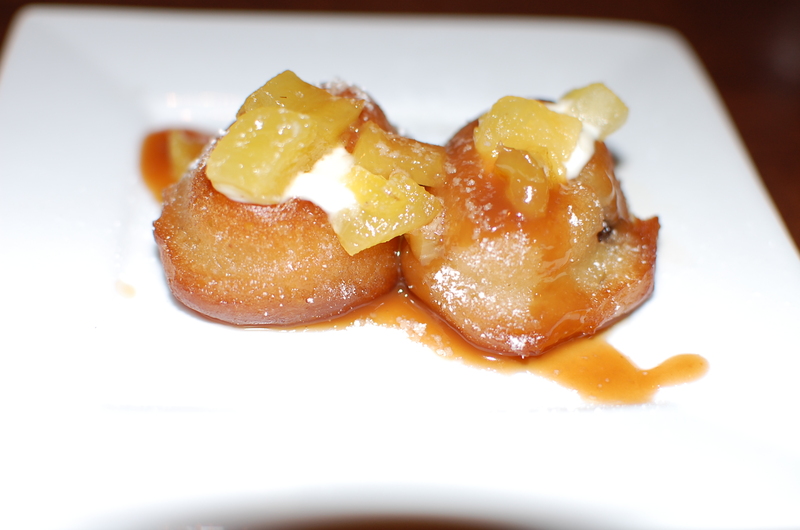 The rum baba was a small cake bathed in rum with crushed pineapple and a little cream on top. Next, we tasted a housemade mint flavored marshmallow with chocolate sauce drizzled on top and decorated with tiny and sweet fresh strawberries. The piece de la resistance was the crepe suzette topped with lemon cream. It was my favorite and satisfied my sweet tooth craving. After a friend’s son was diagnosed with Celiac disease, Francois learned to cook gluten free. He frequently receives requests from his customers and has adapted his menu to have many gluten free dishes. Foodies may enjoy Meteigner’s once a month cooking class in his kitchen. Classes are held on Saturdays from 9 a.m. to 1 p.m. with a sit down lunch and wine for $125 per person. On March 26, he will offer a salt and fresh water fish class. Guests will learn how to identify quality fresh fish to poach, grill and sauté in various sauces. La Cachette does not offer California French style food. Instead it offers updated traditional French fare in smaller portions and more reasonable prices. Open for lunch Tuesday through Friday from 12 p.m. to 2:30 p.m. Dinner hours begin Tuesday through Sunday at 6 p.m. 1733 Ocean Ave. (310)434-9309.